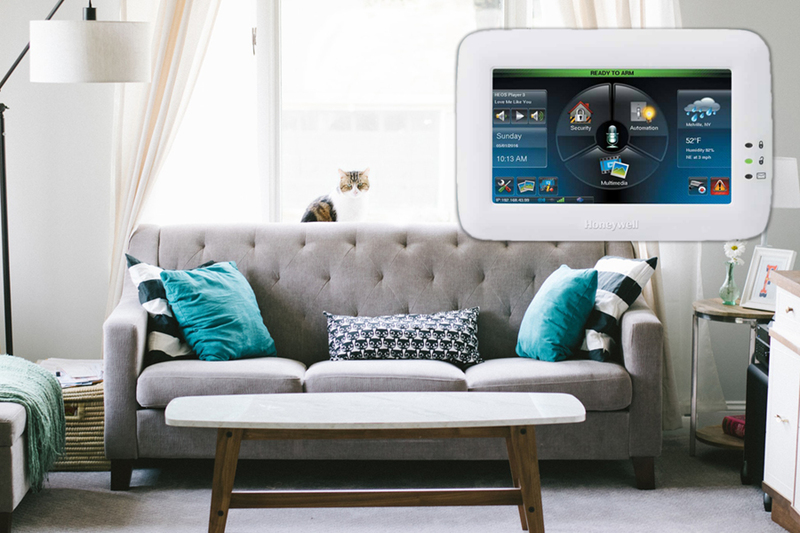 Today at AllState Security, we would be reviewing and discussing the smarted solution to comfort and security which is the Honeywell Tuxedo Touch as Honeywell the ultimate security and comfort solution for your home. Tuxedo Touch is the best way to control your home appliances from system security, shades, lighting, door locks to heating and cooling all from the crystal clear 7” touchscreen. Tuxedo Touch gives you comfort and helps you make a better meaning out of life by assisting you in living it in quality comfort in your lovely abode. Premises control: control is key to comfort and convenience, with the Tuxedo Touch you get on-premise control of your security system and smart home. It also comes with a embedded web server that helps you control your system though your web enabled TV, compatible and smart phone. Lighting, Heating and cooling: an energy-efficient home is the best way to run your home in a cost effective way. The Tuxedo Touch helps to create an energy-efficient home with an automated lighting, heating and cooling that will give you all the comfort you need for the least cost. Lock: security is comfort, with Tuxedo Touch you always in safe hands, you can lock and unlock your doors as well as disarm your security system with just a click on your keypad. Video: you can keep an eye on everything including your kids in your home from anywhere in your home with the Touch Tuxedo live video that allows you to view up to four camera per screen through any compatible gadget including your smart phone. Stylish Design: while providing security and comfort, Tuxedo Touch adds charm to the package by also having a stylish design, it comes with a unique and sleek design from the extra large screens and white or silver choices that gives your videos and pictures a better pop and matches any décor. Wi-Fi: with the Tuxedo Touch Wi-Fi, controlling your system is as easy as ever, with the Control Z-wave enabled light, blinds, thermostat and other things can be accessed and controlled using Wi-Fi. Quality Memories: you can make quality memories and bring memories back to life with the Tuxedo Touch. The high resolution and brilliant display delivers incredible and quality video and photo viewing experience all you need to do is insert your SD card. Tuxedo Touch is a popular smart home item here at AllState Security in Melbourne. We are specialists in Honeywell installations and a reliable consultant that can give you advice on security solution in Melbourne. Maximize Technological Opportunities: with a smart home, the opportunities of technology can be easily harnessed to protect your home and help you live a comfortable life. With the advent of a smart technology in our homes an integrated technological system has proved important in helping to improve control all aspects of your home including accessibility and security giving you a feeling of security and comfort even when you are far away from home. Control: having control of your life is key to living a meaningful life, installing smart appliances in your home where all you need is an app that controls it, you can control your home from anywhere you are, there is no need to worry about forgetting to put off your conditioner when you are out of the house when you can easily do so with just a simple click. With a smart home, there are no limitations to what you can control, whether it is your garage door, lighting, home stereo or lawn car, the control is just one click away on your smart phone. Safety: safety is one of the utmost reasons people want a smart home, it is incredible and calming when you have a grasp of what goes on in your home while you are away and knowing that your possessions are intact just the way you want it. With a smart home, security systems are installed to allow the homeowners monitor suspicious easily. A smart home provides a security system that helps to create a more secure and safer environment for you and your family. Energy efficiency and cost effectiveness: while installing a smart home can be expensive initially, on the long run, it also saves cost as well. Energy tends to take the most part of the bills in the home but a smart home can help you optimize and manage energy easily. With a smart home technology, appliances can work with the least amount of every. Installing a smart home is also cost effective because all appliances run on low maintenance and are designed to work effectively, hence you get the best out of the deal. Accessibility: having access to things easily in and out of your home is part of the perks of a smart home, this is even more useful for the elderly and people with ore form of impairment or the other, with a smart home, living life has become easier because you have access to even the most basic things in your home in a blink of an eye. At AllSate security, you can get these and more especially with the Tuxedo TouchTM by Honeywell. AllState Security is a high end security company that is founded on the basis of a high level of professionalism, dedication, commitment and excellence. The company is vested with a capable team of experts that offer security solutions whether residential or commercial. The Tuxedo Touch is the best choice for security and comfort all provided by AllState Security, with AllState Security you can be sure of a quality, expertise and excellent reputation which has made a big name for the company since its establishment in 1988. From installation, maintenance and alarm repairs to 24 hours of security and ducted Vacuum system, we offer a wide range of services geared at helping you live the comfortable life you deserve in the best way.